Subject: Map / plan: 'Franconia Mountains - White Mountains, New Hampshire'. Condition: Excellent, given age. Middle fold, as issued. General age-related toning and/or occasional minor defects from handling. Please study scan carefully. Size (in cm): The overall size is ca. 20.8 x 15.8 cm. The image size is ca. 20.1 x 14.7 cm. Size (in inch): The overall size is ca. 8.2 x 6.2 inch. The image size is ca. 7.9 x 5.8 inch. Description: This plate originates from: 'The United States with excursions to Mexico, Cuba, Porto Rico, and Alaska. Hnadbook for travellers by Karl Baedeker. ', published in Leipzig, New York and London, 1904. 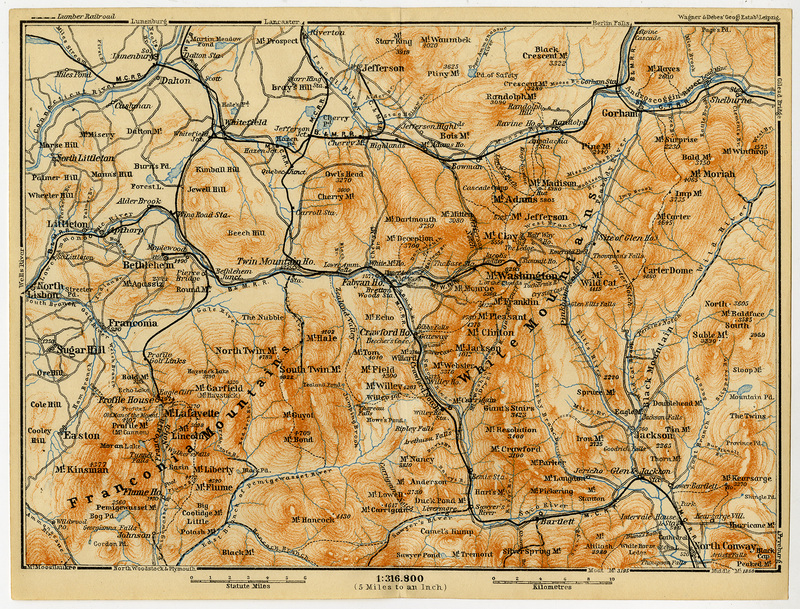 Maps by Wagner & Debes, Leipzig.